Compared to Pterodactylus and Plesiosaurus, Allosaurus is practically a latecomer to the field of Mesozoic palaeontology - though it has something of a convoluted history. The first bones which can be reliably attributed to Allosaurus were brought to the scientific community by famed geological surveyor and former Union Army physician Ferdinand Vandiveer Hayden in 1869: locals at Middle Park in Colorado found curious objects which they described as "petrified horse hoofs." Hayden passed one such specimen on to Joseph Leidy. 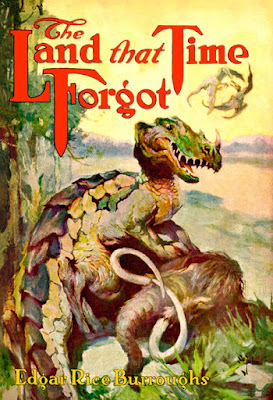 Leidy is probably most famous as the "conscientious objector" in the infamous Bone Wars between Othniel Charles Marsh and Edward Drinker Cope: he protested at the two bone-hunter's destructive adventures, and feared that they would ruin not just the reputation of American palaeontology, but precious scientific discoveries in the process. 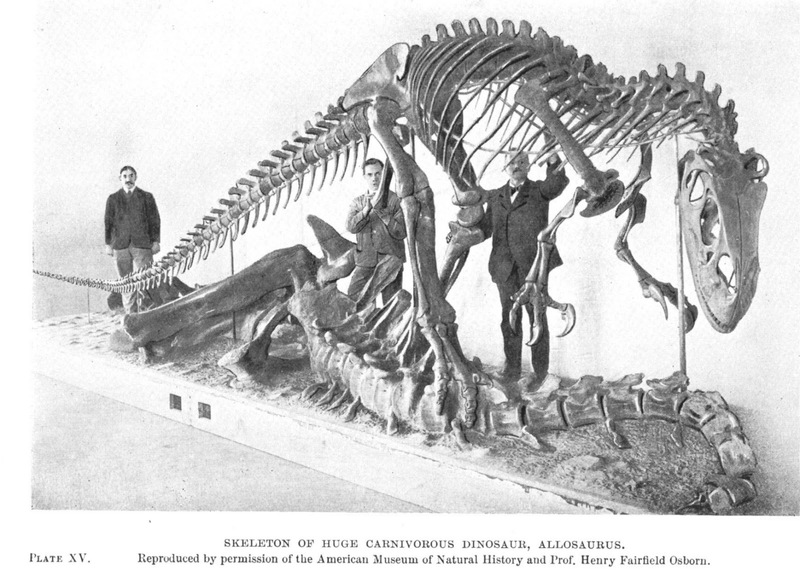 At this point, however, the Bone Wars were yet to commence, and American palaeontology was still a young and relatively innocent field. At first, Leidy thought that the fossil - a partial tail vertebra - was a new species of the still little-understood European theropod Poikilopleuron, which he named Poicolopleuron valens ("strong varied ribs"; consistent spelling was not a priority in the Gilded Age of Palaeontology). 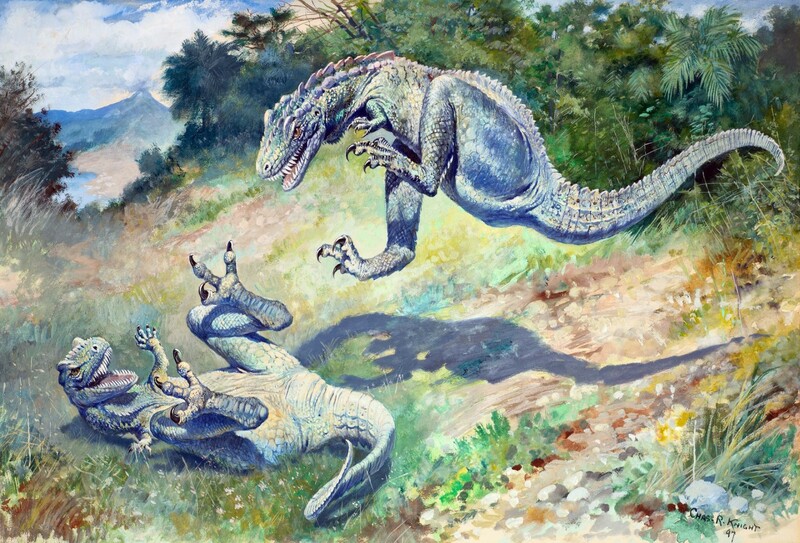 However, after further study, Leidy reconsidered, and after placing the creature in Megalosaurus ("great lizard"), he concluded that the creature was not just a new species, but a new genus. In 1870, Leidy gave the creature the name by which it would be known for decades - Antrodemus valens ("strong chamber-bodied"). For several years, this tiny fragment was all the scientific community knew of what would become one of the most recognised dinosaurs of them all. In 1877, Othniel Charles Marsh collected a number of fragments - part of the right humerus, a rib, a tooth, a toe bone, and three vertebrae fragments - from Garden Park, also in Colorado, and described the remains as a new species: Allosaurus fragilis ("fragile different lizard"). Over the course of the Bone Wars, Marsh and his rival Cope would describe several new species which were remarkably similar to Leidy's Antrodemus and Marsh's Allosaurus: just a year later, Marsh described Creosaurus atrox ("cruel creation lizard") and followed with Labrosaurus ferox ("wild fierce lizard") the year after - both considered synonyms of Allosaurus fragilis - while Cope described Epanterias amplexus ("embracing buttressed vertebrae"), now argued to be Allosaurus amplexus. The first reasonably complete Allosaurus was discovered in Como Bluff in 1879, but because Cope never unpacked the specimen, it wasn't formally described until 1903. 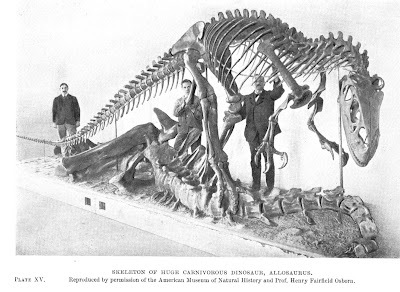 Thus, Marsh beat his rival to the punch with the first nearly complete Allosaurus to be described with a specimen found in Garden Park in 1883. 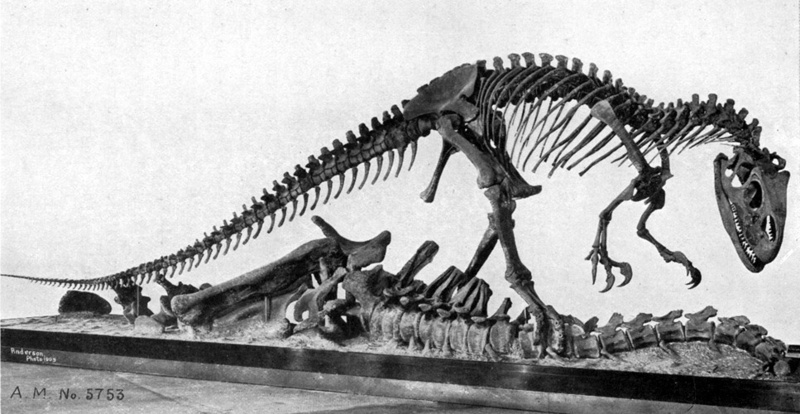 That first skeleton was later mounted in 1908, and became the inspiration for one of Charles R. Knight's most enduring paintings - cementing the popular image of Allosaurus for generations. A COMPOSITE skeleton of a carnivorous dinosaur, whose well-preserved bones were excavated two decades ago by University geologists from a quarry in central Utah, was exhibited for the first time last month, February 18th, in Guyot Hall. An Antrodemus (Allosaurus) specimen which roamed the earth during the Jurassic Perior some 140 million years back, the new arrival is a strapping adult measuring some 25 feet in length and 12 feet in height. The giant herbivorous dinosaurs certainly had enemies, in the form of the large carnivorous dinosaurs, the carnosaurs exemplified by such genera as Allosaurus (more properly Antrodemus) and Ceratosaurus. Among them is another well-known carnivorous dinosaur, Antrodemus [Allosaurus], which was larger and more muscular than Ceratosaurus. 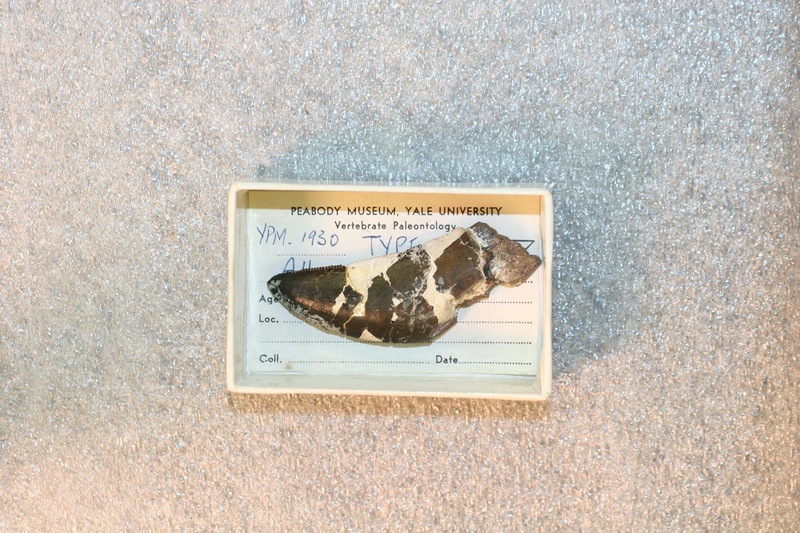 ... at least until 1976, where the decision was overturned on the basis of the specimen's fragmentary nature and lack of detail about its locality. Nowadays, Antrodemus is considered a nomen dubium, while Allosaurus gets to be in Walking With Dinosaurs and Jurassic World: Fallen Kingdom. Hence how you'll find Antrodemus on postcards, reference books, dinosaur parks, town streets, and metal album covers, as well as Allosaurus. 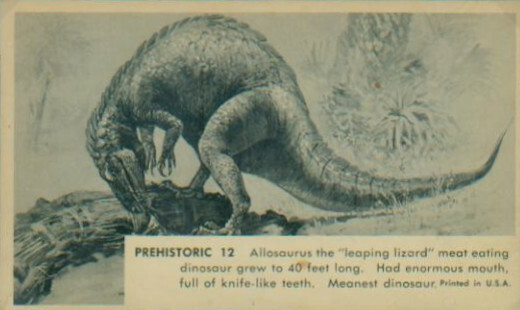 From about the year 1920 to the 1980s, Allosaurus occupied the same curious neverland as Brontosaurus: it was a name rejected or at least qualified by the scientific community at large, yet which crops up again and again in fiction, pop science, and elsewhere throughout the world. 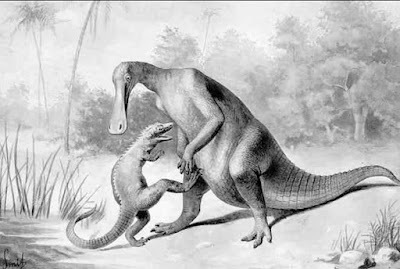 It's a heartwarming irony that both have ultimately been vindicated as distinct creatures from Antrodemus and Apatosaurus without jettisoning the other genera. 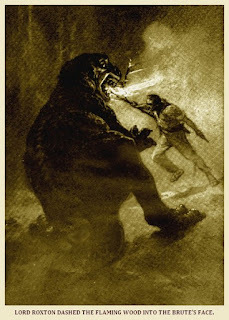 "The indications would be consistent with the presence of a saber-toothed tiger, such as are still found among the breccia of our caverns; but the creature actually seen was undoubtedly of a larger and more reptilian character. Personally, I should pronounce for Allosaurus." "Exactly. 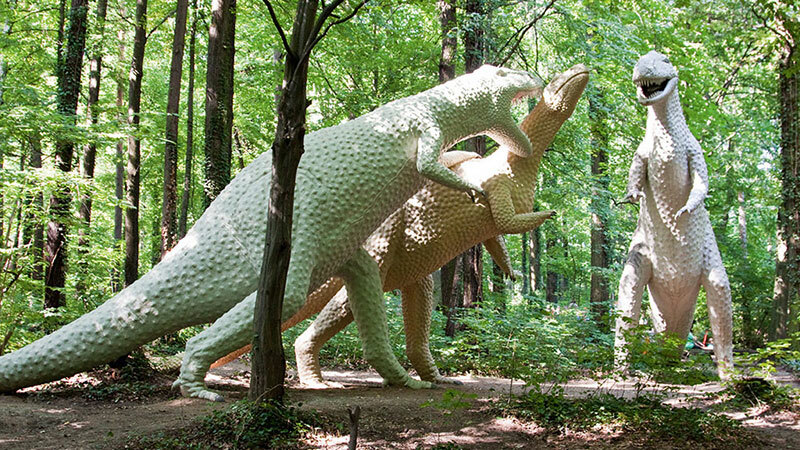 Any one of the larger carnivorous dinosaurs would meet the case. Among them are to be found all the most terrible types of animal life that have ever cursed the earth or blessed a museum." 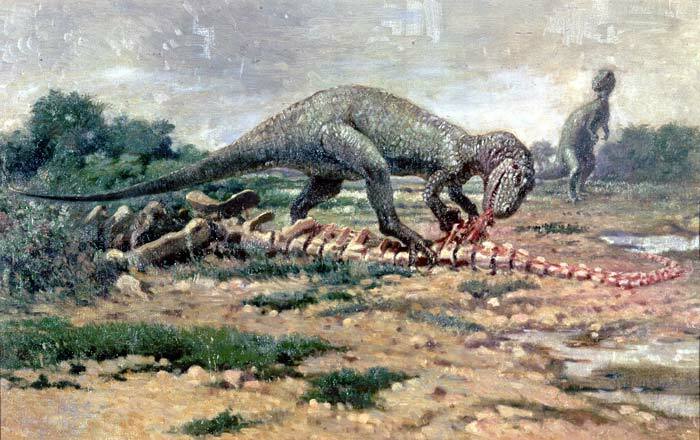 This "lizard-kangaroo" Allosaurus is possibly inspired by another creature - to contextualise properly, we must go back to the Bone Wars. In 1866, Cope described an amazing find - an articulated, reasonably complete skeleton of a large carnivorous dinosaur, one of the very first in the Americas to be discovered. Cope named this creature Laelaps aquilunguis ("storm wind with claws like an eagle's"), the generic name borrowed from a great hunting-dog of Greek mythology gifted by Zeus to Europa. ... We can, then, with some basis of probability imagine our monster carrying his eighteen feet of length on a leap, at least thirty feet through the air, with hind feet ready to strike his prey with fatal grasp, and his enormous weight to press it to the earth. 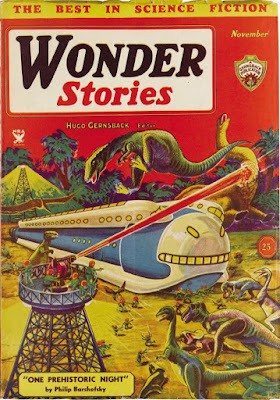 Crocodiles and Gavials must have found their bony plates and ivory no safe defence, while the Hadrosaurus himself, if not too thick skinned, as in the Rhinoceros and his allies, furnished him with food, till some Dinosaurian jackalls dragged the refuse off to their swampy dens. 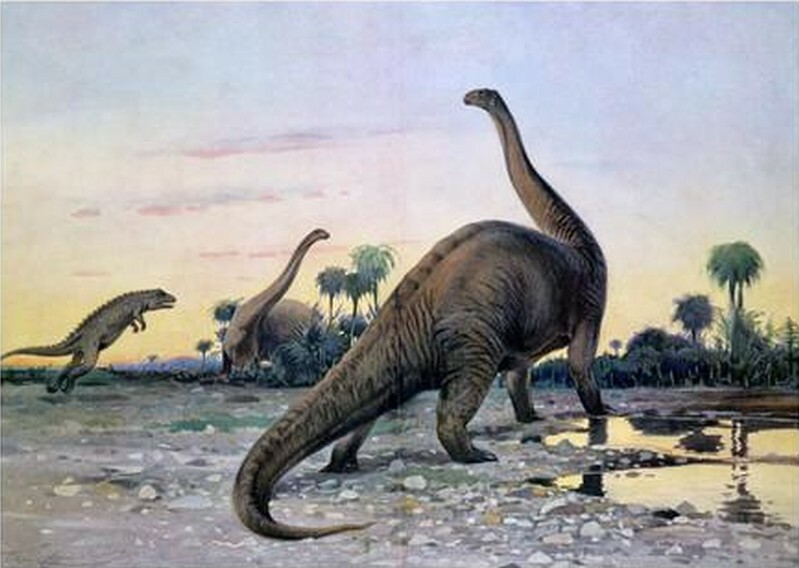 This image has been homaged and referenced in Dinosaur art, media and museum mounts for decades, for the foresight in depicting dinosaurs as vigorous and mobile creatures, and for the sheer dynamism of the action. J. Allen St. John's illustration furnishes A. whitelyi with several distinctive features not mentioned by Burroughs - the nasal horn & crocodilian scales being most obvious - but it's very distinctive, especially when contrasted with the more familiar mammoth. The creature appeared to be a great lizard at least ten feet high, with a huge, powerful tail as long as its torso, mighty hind legs and short forelegs. When it had advanced from the wood, it hopped much after the fashion of a kangaroo, using its hind feet and tail to propel it, and when it stood erect, it sat upon its tail. Its head was long and thick, with a blunt muzzle, and the opening of the jaws ran back to a point behind the eyes, and the jaws were armed with long sharp teeth. The scaly body was covered with black and yellow spots about a foot in diameter and irregular in contour. These spots were outlined in red with edgings about an inch wide. The underside of the chest, body and tail were a greenish white. Ten feet seems well within the historical and palaeontological height range for Allosaurus, whether it's a smaller variety standing straight in a "tripod" stance, or a larger variety in a more horizontal posture, as depicted in Knight's illustrations & the famous American Museum of Natural History mount. 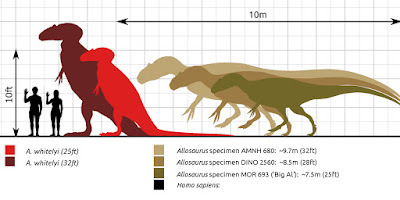 As Cope suggested Allosaurus was plantigrade, that would have knocked a few feet off its height. 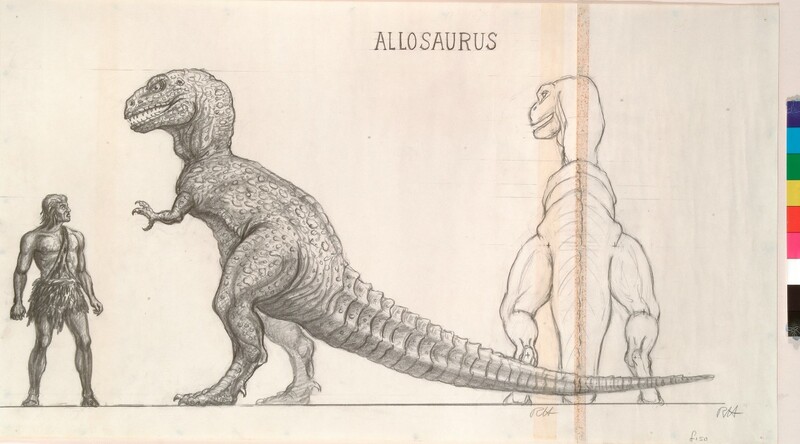 The A. whitelyi Tyler and Whitely encountered could thus be a subadult like "Big Al," a rough estimate of its non-erect stance, or the visual measurement of 10ft simply being an absolute minimum estimate. 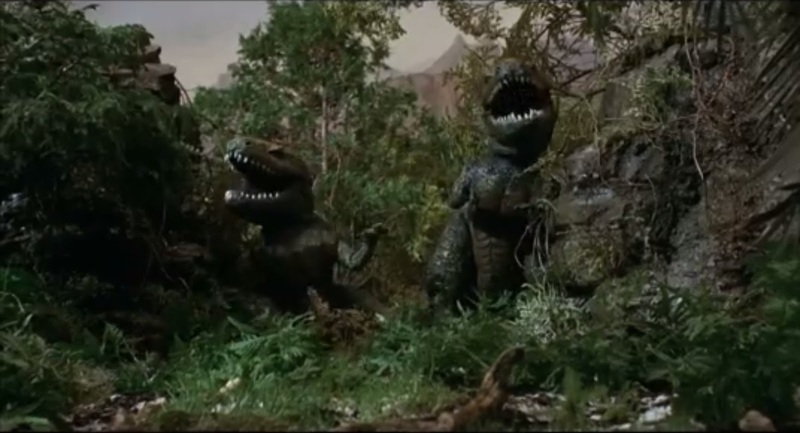 The "hopping" motion as suggested by Cope and interpreted by Conan Doyle strengthens the "leaping Allosaurus" meme which dominated depictions of the creature for decades. Unlike its Maple White Land counterpart, however, A. whitelyi's head is "long and thick," rather than the "broad, squat, toad-like face" of The Lost World: this is more in line with palaeontological discoveries. Burroughs accurately describes the mouth stretching back past the eye, which is also reflected in the fossil record, albeit without the prodigious cheek muscles that broke up the serpentine comparisons. A. whitelyi's colouration is a spectacular divergence from the usual slate grey or mossy green given to dinosaurs, especially in early 20th Century fiction & paleoart. Black and yellow spots with red outlines & greenish white underline: that sounds more like a venomous snake, tropical skink, or rare lizard. Why is A. whitelyi so flamboyantly coloured? There are plenty of natural explanations: it could be signalling that it is poisonous, or venomous, or both - or mimicking a species that is. Alternatively, it could be camouflage, recreating the dappled sunlight piercing the jungle canopy. It could even be advertising - not something you'd normally expect in ambush predators, but Caspak is a strange land, after all. Nobs, though, was lightning by comparison with the slow thinking beast and dodged his opponent's thrust with ease. Then he raced to the rear of the tremendous thing and seized it by the tail. There Nobs made the error of his life. Within that mottled organ were the muscles of a Titan, the force of a dozen mighty catapults, and the owner of the tail was fully aware of the possibilities which it contained. With a single flip of the tip it sent poor Nobs sailing through the air a hundred feet above the ground, straight back into the clump of acacias from which the beast had leaped upon our kill - and then the grotesque thing sank lifeless to the ground. That A. whitelyi could keep up with the creature for such a distance proves it is not the slow, lumbering monster of later dinofiction. The strength of A. whitelyi's tail is clearly developed for locomotion as well as defence, much like the modern kangaroo: it's possible that the tail could function as a third leg, too, which would aid it in acceleration and efficiency. "Because," said von Schoenvorts in his disagreeable way, "the beast is so large, and its nervous organization of so low a caliber, that it took all this time for the intelligence of death to reach and be impressed upon the minute brain. The thing was dead when your bullets struck it; but it did not know it for several seconds - possibly a minute. If I am not mistaken, it is an Allosaurus of the Upper Jurassic, remains of which have been found in Central Wyoming, in the suburbs of New York." This theory of dinosaur nervous systems being so inefficient that it takes several seconds, possibly even a minute, for the signals to reach the brain has been discounted. 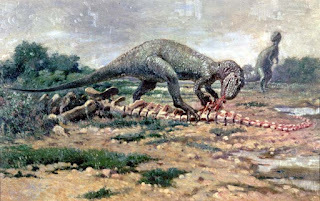 This reached its ludicrous limit in the case of sauropods, where it was genuinely believed by some that the distance between brain and tail in the larger species was so great that a theropod - like Allosaurus - could start feasting on a Brontosaurus without it even feeling the bite for a good minute or two. 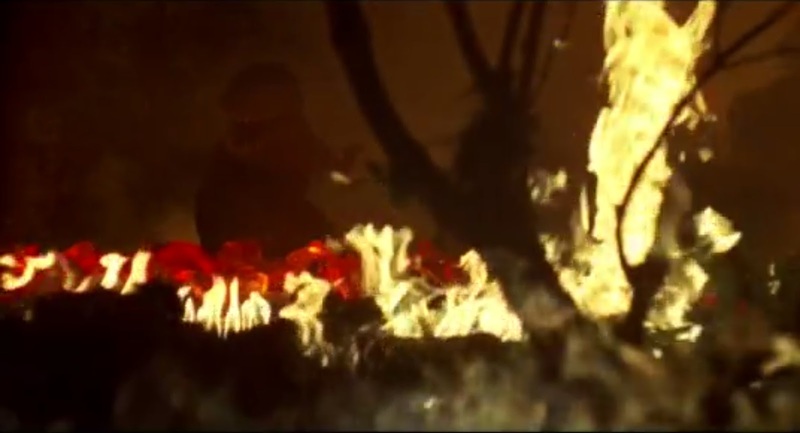 (We'll discuss this weird trope in a future instalment). 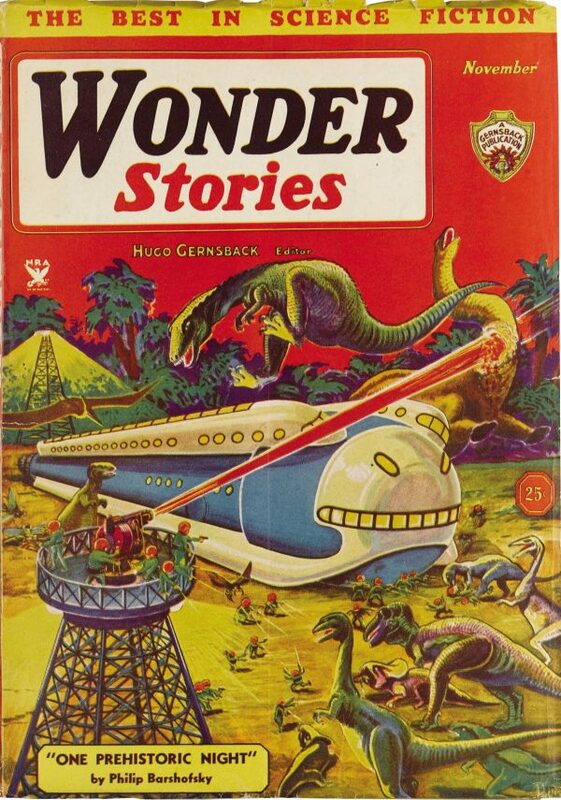 From about the year 1920 to the 1980s, Allosaurus occupied the same curious neverland as Brontosaurus: it was a name rejected by the scientific community at large, yet which crops up again and again in fiction, pop science, and elsewhere throughout the world. It's a heartwarming irony that both have ultimately been vindicated as distinct creatures from Antrodemus and Apatosaurus. Much of Allosaurus' longevity can, no doubt, be attributed to the success of such stories as The Lost World & The Land That Time Forgot, and the plethora of works following in their footsteps. 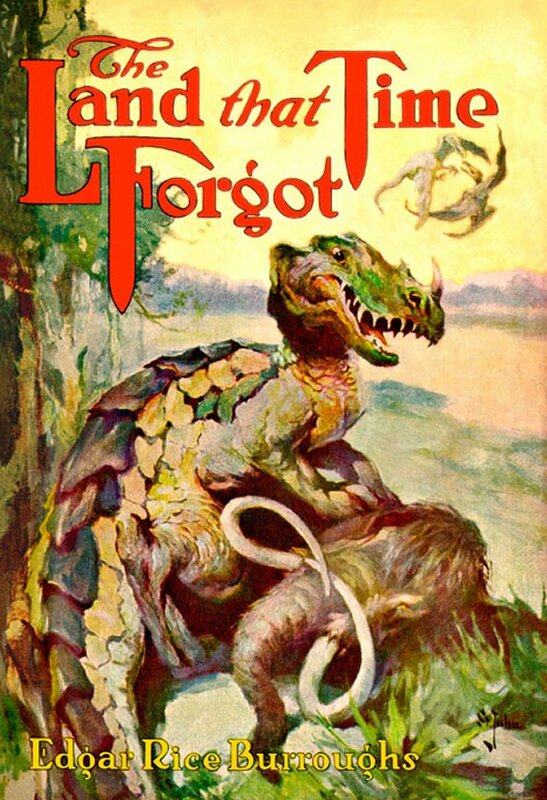 Antrodemus also has a special place in dinosaur literature: it merits a mention in H.C.F. 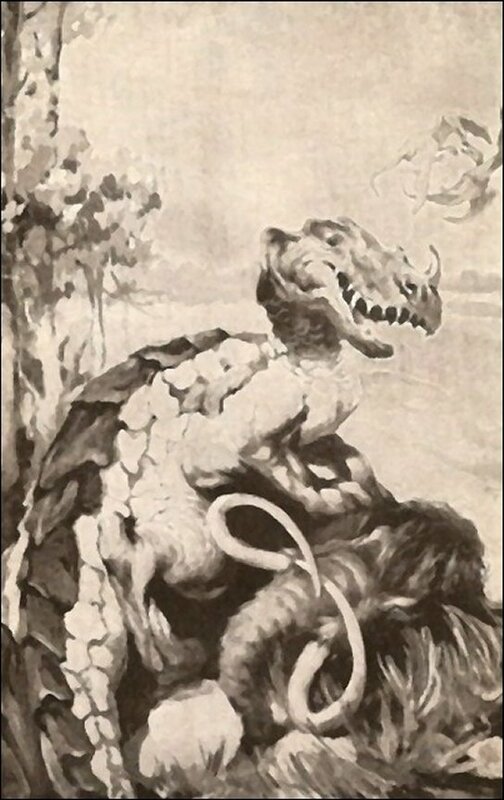 Morant's Whirlaway: A Story of the Ages (1937), and it is one of the creatures listed in the Advanced Dungeons & Dragons Monster Manual II, along with some other once-popular-now-obscure creatures like Dinichthys, Monoclonius, Palaeoscincus, Podokesaurus, and Teratosaurus. 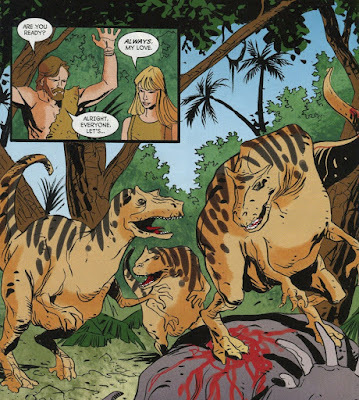 Unlike the tale, Allosaurus also takes on an Agathaumus in a particularly gory battle which goes very badly for it: during the fight, we can see Allosaurus leaping onto Agathaumas' back, just as Cope suggested, and hinted in the books. 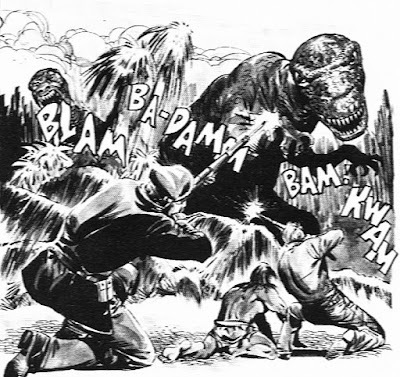 Another Allosaurus does battle with a Brontosaurus shortly after - the very beast which terrorised London at the film's conclusion. 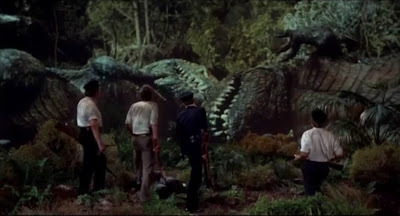 Although Allosaurus was superceded by Tyrannosaurus in O'Brien's masterpiece King Kong, Big Al received a starring role in The Beast of Hollow Mountain (1956) - well, the last 15 minutes, at least - and his protégé Ray Harryhausen provided some of the best Allosauruses ever to rule the silver screen. 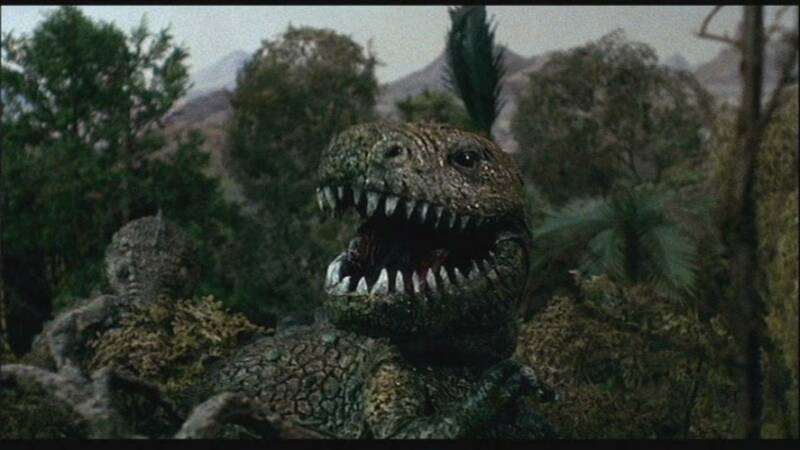 The interesting motif of depicting a smaller, possibly juvenile Allosaurus is most famous in One Million Years B.C. (1966), when one such creature attacks Loana's tribe. 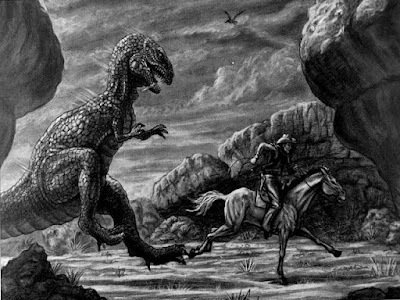 Harryhausen's sketch doesn't look a million years off A. whitelyi, does it? In Harryhausen's final dinosaur adventure, a fully-grown Allosaurus takes the title role in The Valley of Gwangi (1969). Gwangi is possibly the definitive cinematic Allosaurus in the same way the Skull Island Tyrannosaurus was before Jurassic Park's Rexy changed dinosaur cinema forever: to this day, he remains an monument to Harryhausen's genius, as well as an icon for American palaeofiction: the juxtaposition of creatures the world forgot with the rough and crude adventuring that was the Wild West epitomising not just the fiction, but the reality of Gilded Age Palaeontology. In every Harryhausen film, the dinosaurs are active, energetic, and fast-moving, just as described by Conan Doyle and Burroughs, and as vindicated by current palaeontological investigations. 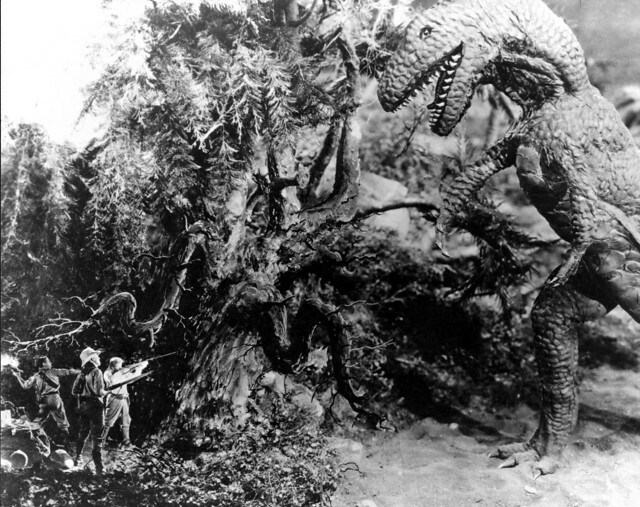 However, the "cold-blooded monsters" meme started to dominate scientific thought in the mid-20th Century, and fiction followed the contemporary science. Frank Belknap Long's "Temporary Warp" (1937) features a sluggish brute of an Allosaurus in this bizarre space-time-twisting adventure. From a technical point of view, it's hard to fault Roger Dicken's puppets: given the cost and time constraints, not to mention the technology of the 1970s, he and the effects team do as good a job as can be expected. 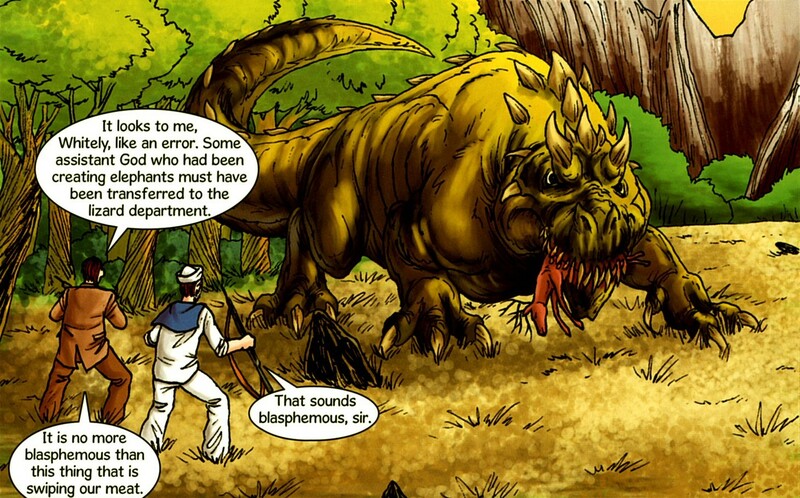 However, this was just on the cusp of the Dinosaur Renaissance: the prevailing idea, in the public eye (about 10 years behind the scientific community) was that dinosaurs were sluggish, lethargic, stupid creatures that became extinct through sheer ineptitude. The idea that they were fast, bounding, warm-blooded animals was unfashionable: in a cruel irony, you might even argue that this was an attempt to "update" Burroughs to be more "accurate." Tan with dark stripes isn't red-ringed black & yellow spots with a green-white ventral pattern, but at least it isn't a tinted grey. 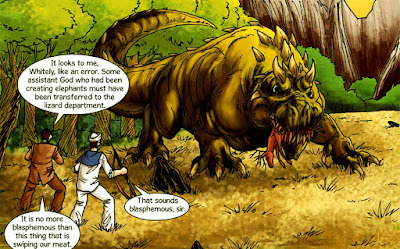 Allosaurus continues to be a popular dinosaur, and fictional individuals abound in comics, books, and films: Cutter and Hermes in Xenozoic Tales; the unnamed mother Allosaurus in Age of Reptiles; Big Alice in Land of the Lost, and beyond. It featured in countless video games, comics, films, tv series, documentaries, cartoons, and other media, holding its own against its charismatic tyrant relative. For all its outlandish colours and kangaroo-hops, A. whitleyi was one of the first - and most influential - of that fictional pride of Lions of the Jurassic.